Chicken, enchilada sauce, beans, peppers, and lots of southwestern flavors come together in this easy 'dump and go' soup. Just throw it all in your slow cooker and you are good to go! 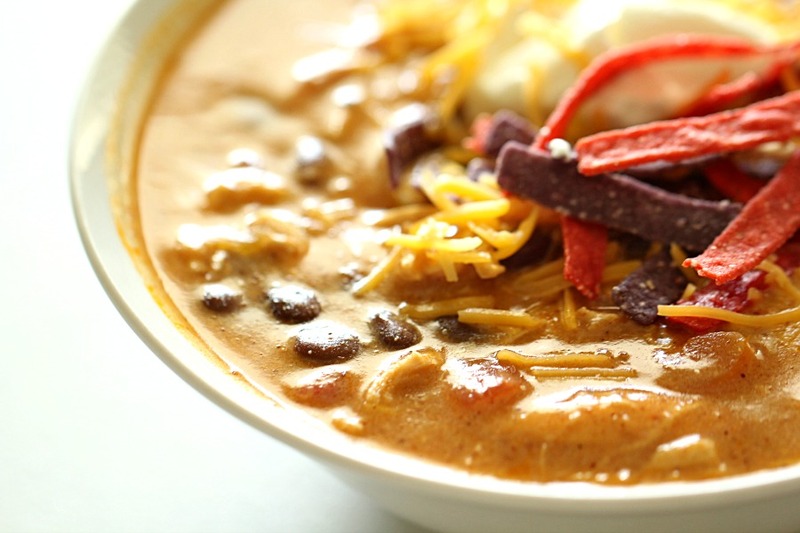 There is a restaurant here in Utah called Cafe Zupas that has the best soups, salads, and sandwiches – we love to eat there when all the sisters are in town and this Chicken Enchilada Soup is one of our favorites on their menu. 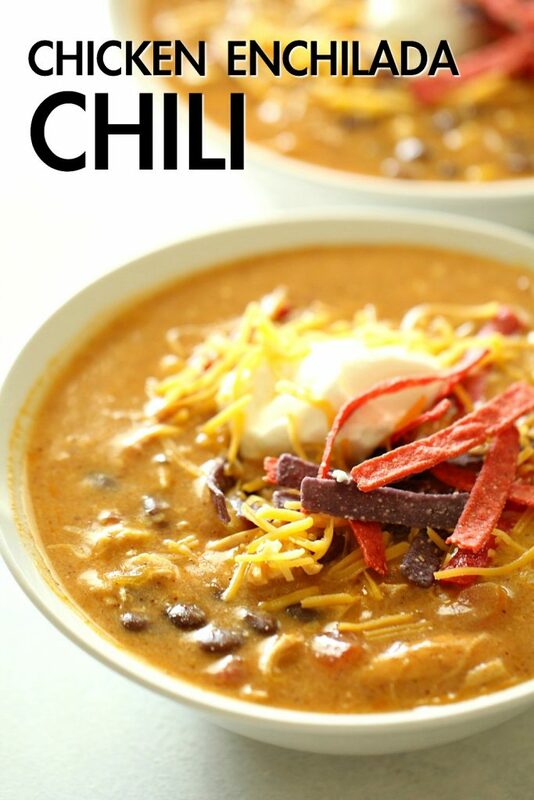 It’s creamy, it’s a little spicy, it’s hearty and delicious – top it off with some cheese and crunchy tortilla strips and I am a happy eater! My family loves soup and so I decided to come home and recreate it. 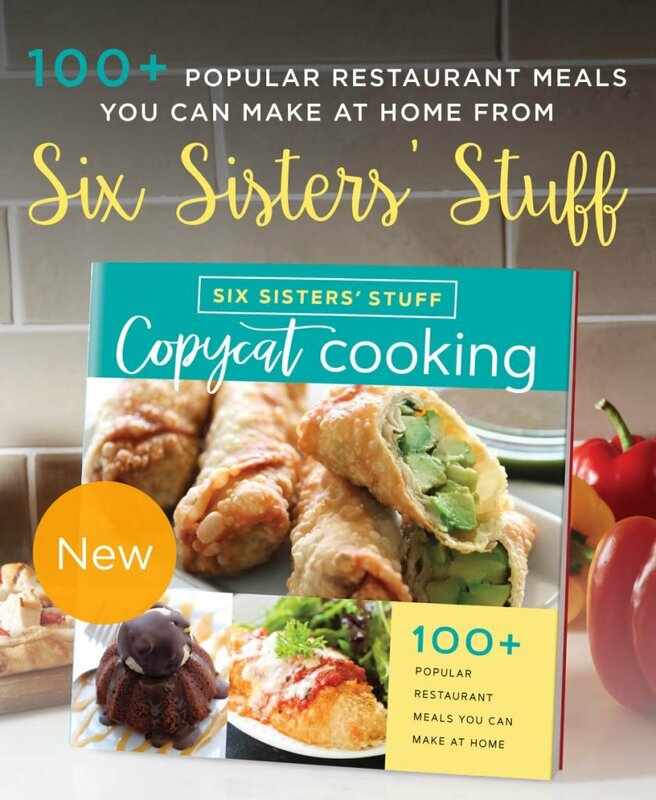 There are a lot of recipes out there, but I kind of tweaked them all to make my own. I upped the vegetable content by adding some red and green peppers plus some onion (Cafe Zupas says that they use “fresh southwestern vegetables”, so I felt good about adding some peppers in!). I don’t know if Cafe Zupas makes their soup in a crock pot, but I love the simplicity of dumping ingredients in to the crock pot and letting it slow cook all day long. This recipe is one of those “dump-n-go” recipes that we know I love (if you need more slow cooker recipes, be sure to check them all out here! We have hundreds!!). In a slow cooker, dump the chicken, enchilada sauce, cream of chicken soup, Rotel tomatoes, black beans, corn, bell peppers, onions, chili powder, cumin, paprika, garlic powder, and salt in the slow cooker. Cook on low for 6-8 hours (or high for 3-4 hours). Remove chicken breasts, add in shredded cheese, sour cream, and milk (as much or as little as you prefer). Shred the chicken breasts and add it back in. Let it cook for 15-20 more minutes in the slow cooker until it reaches the creaminess you prefer. Serve with tortilla strips, sour cream, and shredded cheese. Can I add the milk, sour cream, and cheese at the beginning of the recipe? I wouldn’t recommend adding your dairy ingredients at the beginning of cooking this recipe and letting it simmer all day long – the milk, sour cream, and cheese may curdle. Even if you were going to be at work all day, you really could let this cook on low while you are gone and then all you have to get home is shred the chicken and then mix in the dairy items – the hard part of cooking the soup is done! 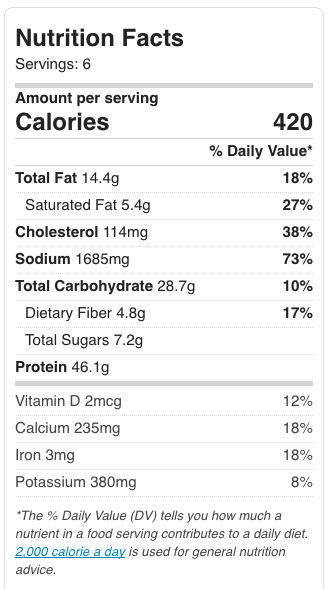 What are the nutrition facts of this chicken enchilada soup? The nutrition facts will vary with the different brands of ingredients that are used, but here you can have a general idea of the nutrition for this recipe. To lower the sodium in this recipe, use low-sodium canned goods (such as the corn, black beans, cream of chicken soup) and omit the salt. These nutrition facts do not include the optional toppings, so your actual intake will vary based on what you put on top of your soup. Spray a large slow cooker with non-stick cooking spray. Add the first 15 ingredients to the slow cooker (from the chicken through the salt) and let cook on low for 6-8 hours or until chicken is fully cooked. Remove chicken from slow cooker and add in cheese, sour, cream, and milk (as much or as little as you prefer). Shred the chicken with two forks and return to slow cooker. Let soup cook on low for 15-20 minutes or until cheese is melted and soup has reached desired thickness. Serve topped with sour cream, shredded cheese, and tortilla strips if desired. 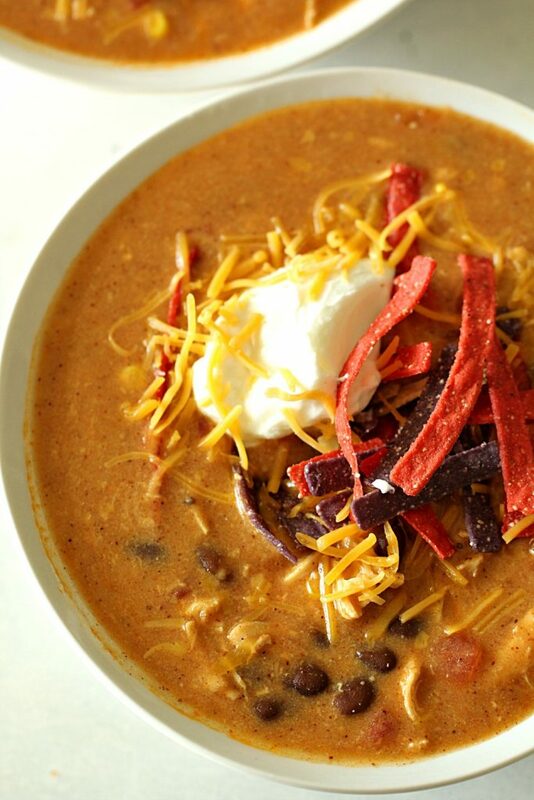 Here are some of our favorite Dump and Go soups for the Instant Pot!